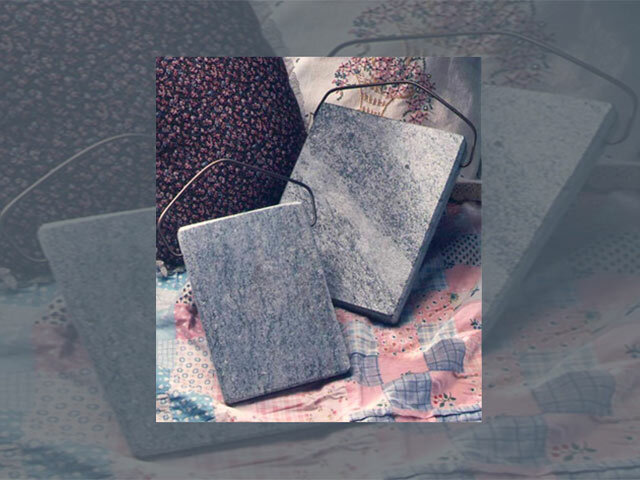 First patented by us in the 1860’s and in use for generations, your new handmade soapstone bed warmer will provide years of no maintenance service. Soapstone’s unique heat storing ability allows you to heat it in the evening and enjoy a slow release of the heat all night long. First: attach the handle … or not. Simply spread the handle and insert into the side holes, this is optional. In years past the soapstone bed warmer would have been hung by the fireplace or wood stove all day. Today heat it to 105-110 degrees in the oven or even place on a sunny window sill for the day. The only thing we don’t recommend is a microwave. The correct temperature is that you want to be able to handle it, but not hold it. Run across the bed sheets to warm them, wrap in a blanket or towel and place at the foot of the bed, lower your thermostat, save energy and enjoy a comfortable nights sleep. Each handmade soapstone bed warmer is finished and shipped to you postage paid (US). $42.50 each. Standard soapstone dimensions: 8″x10″x1 1/4″. Please call at 1-800-284-5404 and we will be happy to assist you.